Capable of upending rural livelihoods, compromising institutions of governance, and inducing new patterns of migration and crime, global water stress has emerged as one of the principal threats to U.S. national security, said David Reed, senior policy advisor at the World Wildlife Fund (WWF) and editor of WWF’s new book, Water, Security and U.S. Foreign Policy, on June 27 at the Wilson Center. Four defense and development leaders – retired U.S. Marine Corps General James L. Jones; Paula Dobrianksy, vice chairwoman of the National Executive Committee of the U.S. Water Partnership; retired U.S. Navy Admiral Lee Gunn, vice chairman of the CNA Military Advisory Board; and Kristalina Georgieva, chief executive of the World Bank – joined Reed for a panel discussion of water’s central role in global stability and prosperity. “National and international security in the 21st century is a much broader portfolio for our government to think about than it was in the 20th century,” said Jones, who served as national security advisor in the Obama administration from 2009 to 2011. 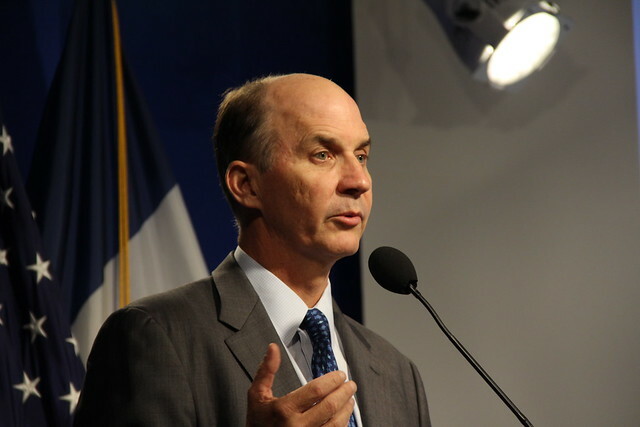 As part of this new portfolio, Gunn urged the U.S. government to “consider the challenge of global water stress as a national security concern.” Already, water scarcity has played a role in exacerbating subnational strife, driving insurgencies, and spurring instability around the world. In the face of these perils, the panelists discussed a reinvigorated approach to water insecurity – one based on committed U.S. leadership, a whole-of-government response, and private sector innovation – to address the needs of a growing human population. In recent years, the United States has made some progress: The Senator Paul Simon Water for the World Act of 2014, passed with bipartisan support, requires the U.S. president – in conjunction with the State Department, U.S. Agency for International Development, and other agencies – to submit to Congress its first-ever Global Water Strategy by October 1, 2017. This strategy must clearly outline how the United States intends to help high-need countries improve access to sanitation and hygiene, shore up water management programs, and settle disputes over water resources. The Global Water Strategy is particularly notable because it incorporates the wide-ranging expertise of several federal agencies and departments. “Water often has been somewhat stove-piped in the way in which it gets dealt with in terms of certain sectors,” said Dobriansky. “But here there’s a real emphasis, at least as I could see it, on a whole-of-government approach to the issue.” This all-encompassing approach “requires not just USAID and DoD but also USDA and the [intelligence community] and all the other elements of government,” said Gunn. Since thermoelectric power plants – those fueled by coal, natural gas, oil, and nuclear power – use water in the process of generating electricity, water consumption is intimately linked to energy needs. According to the International Energy Agency’s 2016 World Energy Outlook, thermoelectric power plants in 2014 withdrew 342 billion meters3 of water, and consumed enough water – 17 billion meters3 – to address the water shortage in Yemen twelve times over. “The energy framework is terribly important to the management of water worldwide in those places where it’s not only necessary to get the water situation under control, but also to provide for the energy demand that is going to increase,” said Gunn. Today, the coal industry – which generates 41 percent of the world’s electricity – is among the world’s largest users of freshwater; in the United States, it is responsible for two-thirds of all the freshwater withdrawn and consumed by thermoelectric power plants. Globally, more than 50 percent of the countries that produce and consume the most coal face high levels of water stress. To avert an imminent water crisis and the ensuing harm to human health, economic productivity, and infrastructure, Gunn suggested that governments prioritize advanced energy – a broad category that includes renewable power sources, like wind and solar photovoltaic, which tend to be less water-intensive than traditional fuels like coal. The sheer amount of investment needed to install, renovate, and maintain water infrastructure is staggering. A 2016 World Bank analysis estimated that the cumulative cost of adding new water and sanitation services to meet Sustainable Development Goal 6 – achieving universal access to basic water, sanitation, and hygiene services by 2030 – was $454.4 billion. Providing safely managed drinking water – which is located on premises, readily available, and free from microbiological and chemical contamination – will require capital investments of $114 billion each year, or triple the current funding levels. The World Bank also found that the gross cost of adapting water supply and flood protection systems to the impacts of climate change is upwards of $24 billion every year through 2050. Between 1990 and 2012, African governments formed 51 public-private partnerships in the water, sanitation, and desalination sectors, with total investment exceeding $3 billion. These partnerships tended to increase efficiency, reduce water loss, limit cost overruns, and meet construction deadlines, thanks to stronger management incentives. Moreover, small-scale public-private partnerships in remote areas with smaller populations appeared to enhance equitable water access by providing much-needed capacity and keeping water prices affordable. While there is still work to be done in optimizing their specific financial configurations, public-private partnerships may represent a revolutionary model of global development. The number of people served by public-private partnerships in urban water utilities expanded from 6 million in 1990 to 160 million by the end of 2007, and the majority of contracts awarded since 1990 – 84 percent – were still active in 2007. (Only 9 percent were cancelled early.) Larger developing countries, like Algeria, China, and Malaysia, now depend heavily on private operators for their water needs. “Investment in development is investment in security,” said Georgieva. Without reliable access to water, sanitation, and electricity, “there is no chance for communities to prosper.” In regions suffering from water scarcity, economic growth rates may fall by as much as six percent. Soaring food prices, breakouts of preventable disease, and more frequent instances of violence add to the burden. And, while fears of impending “water wars” may be overblown, in governance and prompt greater demands for U.S. humanitarian and military interventions. At the same time, however, the effective management of water can mitigate, and possibly prevent, these troubling scenarios. In fact, under the right circumstances, water can serve as a foundation for peace. When communities in conflict coalesce around shared water resources, they are more likely to develop a sense of interdependence – an understanding that, in spite of past grievances, their survival and prosperity are inseparably linked. This initial dialogue may then help reconcile competing interests, forge trust, and eventually yield a “peace dividend” that facilitates cooperation in other sectors, including food, energy, and economic development. In the Levant, Jordanian, Israeli, and Palestinian communities have worked together to manage transboundary water resources, reduce water pollution, and even build a “peace park” outfitted with eco-lodges and trails. Going forward, more flexible water accords, improved sharing of hydrological data, and the integration of water and other environmental considerations earlier in peacebuilding efforts can enhance the capacity of water cooperation to resolve conflicts and underpin international security.